Like previous ceremonies, two (pre and post) events support the quarter’s official release. First, a U.S. Mint-hosted coin forum will take place the evening before the ceremony, and then the traditional coin exchange immediately follows the launch. Both are free and open to all ages. 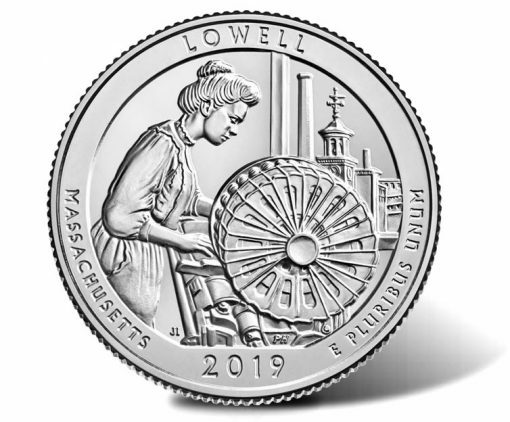 Lowell quarters will enter circulation on Monday, Feb. 4, but it could be months or years before they become a common sight in regular commerce because Federal Reserve Banks distribute coins to financial institutions without regard to their designs. Hence, the quarter ceremony and exchange are an early way to get this first of the five 2019-dated quarters. The U.S. Mint offers another by selling them in rolls and bags. The Lowell High School JROTC Honor Guard, Senior Class President, band, and chorus will partake in the ceremony as well. The coin exchange begins immediately after the quarter ceremony. Participants can swap cash for $10 rolls of the new coins. A one-roll ($10) minimum and a 10-roll ($100) maximum is common. The United States Mint will also host a coin forum for the public on the evening before the ceremony. This free event provides insight about the role of U.S. Mint and allows guests to express their views on the Mint’s products. Coin forums tend to last around an hour. The following map shows the location of the park. On Monday, Feb. 4, starting at noon EST, the U.S. Mint will begin selling Lowell quarters to the public. Product options include 40-coin rolls, 2-roll sets, 3-roll sets, and 100-coin bags at prices ranging from $18.95 to $46.95. They will be available for order online at catalog.usmint.gov. These product releases will also be covered here on CoinNews. At the start of this year, on Jan. 5, the U.S. Mint released collector proof versions of all five 2019 quarters for $15.95. These coins exhibit frosted designs and mirror-like backgrounds. I realize that the quality of designs for the America the Beautiful quarters vary quite a bit. While the design for the Lowoll National Historical Park is quite good, I feel that the artist could have spent a little more time in rendering the mill girls hair. For some reason the hair reminds me of someting you would find on a Raggedy Anns Doll. On the brite side, in forty years, after some good honest wear on the quarter, the girls hair should look very natural. Its just a matter of time.